This summer I had the privilege of spending a few weeks in Uganda to conduct fieldwork related to schistosomiasis and sleeping sickness. There are many things I could write about my experiences, both positive and negative, yet I feel that words will always fail to capture the intensity, admiration, the wonder and sometimes despair of it all. I thought in this post I would therefore focus on some images, in particular images ‘from above’ that help to illustrate some of my experiences. Aerial images such as those taken by satellites (‘remote sensing’) play a big role in my research currently, as I use these images to help me to find associations between disease transmission risk and environmental features of the landscape. I am continuously amazed by firstly how much visual information there is about the world we live in, and secondly how beautiful the world looks from above. So here’s two little demonstrations of the added benefit of aerial images that relate to my Uganda trip. The invasion of the water hyacinth Schistosomiasis (also know as bilharzia, transmitted in freshwater) is a huge problem in Uganda, particularly in communities along the lake shores. Despite tremendous efforts to control it, the constant use of the lake for daily activities such as washing, swimming and collecting water for cooking and washing results in community members constantly being at risk of infection. During my visit, alongside two MSc students, a PhD student, two LSTM staff members and with the excellent support of the Ugandan Vector Control Division, we were conducting school-based prevalence surveys plus freshwater snail sampling activities (as snails are an intermediate host of the disease) in order to assess the geographical variability in schistosomiasis risk. Unsurprisingly we found that the school surveyed closest to the lake (in this case, Lake Albert) had the highest burden of disease. When trying to identify locations on the lakeshore where people were most likely getting infected however, our snail-seeking efforts often left us empty-handed, despite previous researches easily finding a plethora of snails in the past. Whilst a little unexpected, on looking at the shoreline the reason behind this wasn’t much of a mystery as it was completely covered up with dense vegetation, which I soon learnt was water hyacinth. You can see how this looks from ground level in the photograph I took. Water hyacinth are not native to Uganda, but were introduced in the 1980s, possibly as a decorative addition to ponds, and since its introduction has done a huge amount of damage to the eco-system. 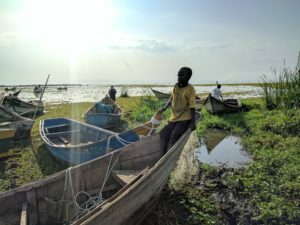 Its effect on schistosomiasis transmission isn’t clear (despite our inability to find many snails, it’s thought to increase suitable snail habitat), but it has had a devastating impact on the livelihoods of lakeshore communities by reducing the fish population, and physically restricting their ability to fish. Whilst the view from the ground gives some impression of the scale of the water hyacinth ‘invasion’, it is from above that we really start to visualise the extent of the problem. The PlanetScope imagery below (~3m) compares the lake shore alongside the village of Bugoigo in October 2016 and June 2017, showing the huge build up in the weed over this period. PlanetScope images are captured daily (see www.planet.com for more details), and we’re currently looking at whether we can use these images to track these changes in environmental features, and learn more about how this may impact local communities. 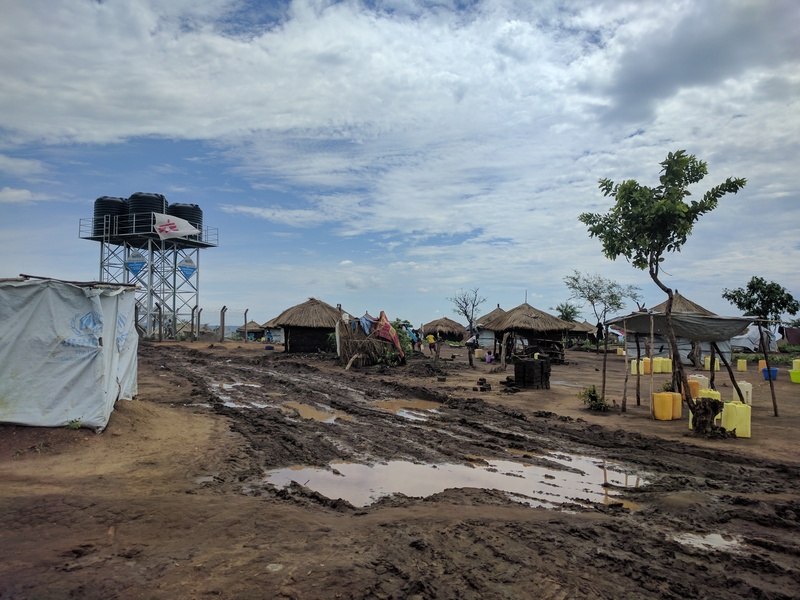 Refugee camps in northern Uganda The landscape in northern Uganda has seen rapid, dramatic changes in the last 12 months or so due to the arrival of hundreds of thousands of refugees who are fleeing the civil war in South Sudan. The Ugandans, with the support of agencies such as UNHCR (the UN Refugee Agency), have demonstrated enormous compassion for their neighbours which includes allocating all arriving refugee families with a 30m2 plot of land, and allowing all refugees to access to public services such as health and education. With the number of refugees now thought to exceed 1 million (85% of which are women and children under 18), this has resulted in huge sections of previously unoccupied land now being used as (well-structured) refugee camps. The image below shows an aerial view of one of these camps (Bidi Bidi), and the rapid development of its gridded structure over a period of 8 months, plus here’s a photo I took of how things looked on the ground in May 2017. Accurate information on this ever-changing landscape is vital to humanitarian agencies, allowing them to provide aid as efficiently as possible. If you head to popular mapping services such Google Maps and navigate over the location of these camps, you’re going to see a big empty landscape as these service providers don’t generally prioritise the mapping of these areas. There are some fantastic organisations however that are addressing these gaps in our knowledge of the world’s landscapes, one of which is the Humanitarian OpenStreetMaps (OSM) Team, also referred to as HOT. Through local mapping activities plus a committed community of volunteers who help to digitise high resolution images such as those captured by commercial companies like Planet, detailed up-to-date maps of buildings, roads and facilities in these camps are publicly available for all that need them. Take a look at these OSM maps by clicking here, and compare this to what you can see on Google Maps here. The arrival of refugees in northern Uganda is also raising some interesting issues relating to disease control, including the sleeping sickness project I’m working on. For example, uninhabited areas previously not thought to be a priority for sleeping sickness control e.g. by controlling the tsetse flies that transmit the disease, are now inhabited by refugees. These refugees are also coming from areas where sleeping sickness is a problem, and so control teams are now evaluating whether there’s an increased risk of further infections as a result. You can read more about the implications of the arrival of refugees on sleeping sickness elimination in northern Uganda here and here. As part of my own research, I plan to use satellite imagery to look at the impact of refugee camps on the distribution of tsetse flies as part of my FOCAL-NTDs project. Should you wish to support the refugee resettlement efforts, please donate to the UNHCR here. I know that my enthusiasm of aerial imagery can’t be shared by all, but I hope this gives you a little insight into what it’s possible to learn from the remotely sensed images such as those shown in this post. With technology to capture these images becoming easier and cheaper to obtain, I’m excited to see what else can be achieved! If you’re looking for further inspiration, I’d recommend having a listen to the Planet Money podcast episodes on satellites and the possibilities of satellite imagery! ← Aiming higher! Extra schistosomiasis treatment needed at high altitudes?